Price: Medium to high (La Huella is perhaps the most popular dining spot in the entire Punte del Este so it can charge what it wants, although it is not over the top and the food as well as the service end up being a great value for money). Ambiance: Bohemian, rustic and trendy. 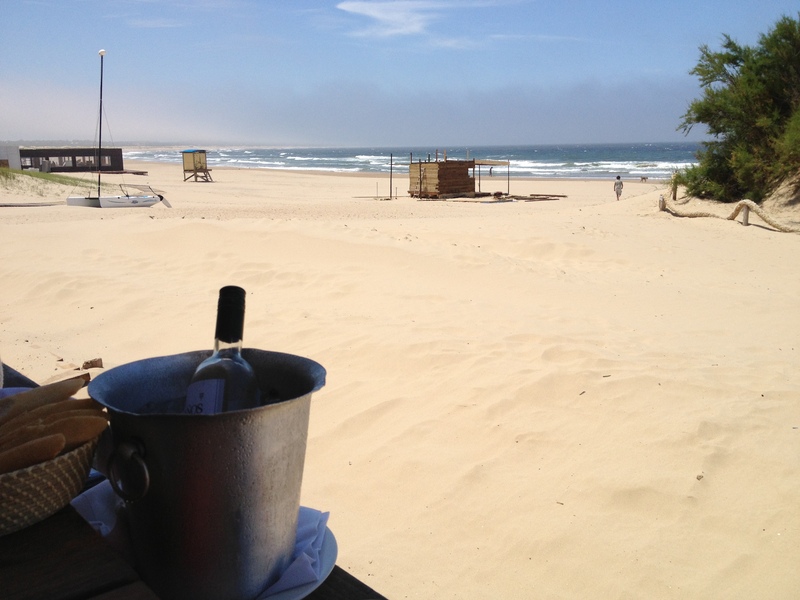 La Huella is one of the most desirable restaurants in the area of Punta del Este and for that it attracts anyone trendy – from international celebrities to great vibe and food seeking tourists. La Huella is located right on the beach so I would not recommend ladies to wear super-thin heels either for the comfort reasons as well as looking out-of-the-place. Imagine St Tropez 20-30 years ago, sandy dunes and Le Club 55 – the hotspot of the rich and famous for decades and you will get La Huella. 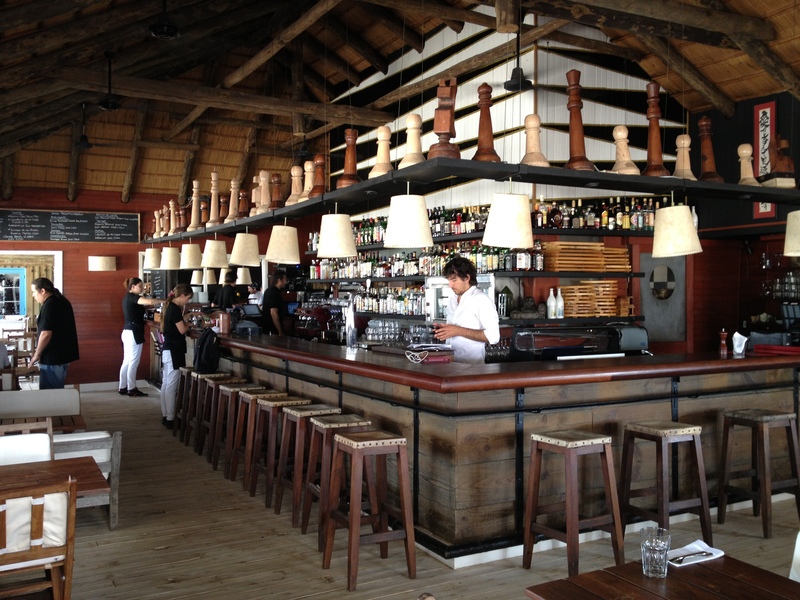 Its chill-out ambiance, rustic wooden bar with chess-pieces peaking over your head, open kitchen and grill back room and large terrace facing the beach will transfer even the sturdiest workaholic into the realm of nostalgic dreams. Beach clothes and short during lunch are fine – long pants and mosquito spray in the evening if you sit outside. Food: Fresh, authentic and tasty. I have eaten at La Huella twice. After three out of three people, who know the area well, recommended me eating here, plus the answer to my question “Where would you eat around Punta del Este on your birthday?” being “La Huella”, I knew this place must be outstanding. Perhaps I look biased, (after all the bottles of wines I consumed there it is entirely possible as I tend to like everything after three glasses of this god-blessed liquid), but I am sure about one thing: You must eat there at least once when in the area. The food is a mix of Peruvian, Argentine and Uruguayan cuisines. Fresh and mostly local ingredients are used in preparation and the cooks try to make the plates look cool. From the peruvian fare I loved the White fish ceviche s well as the Potato causa filled like lasagne with a creamy layer of salmon, mayonnaise and onions. Both were authentic, no fuss and simply delicious. Another great starter is the Warm goat cheese salad. 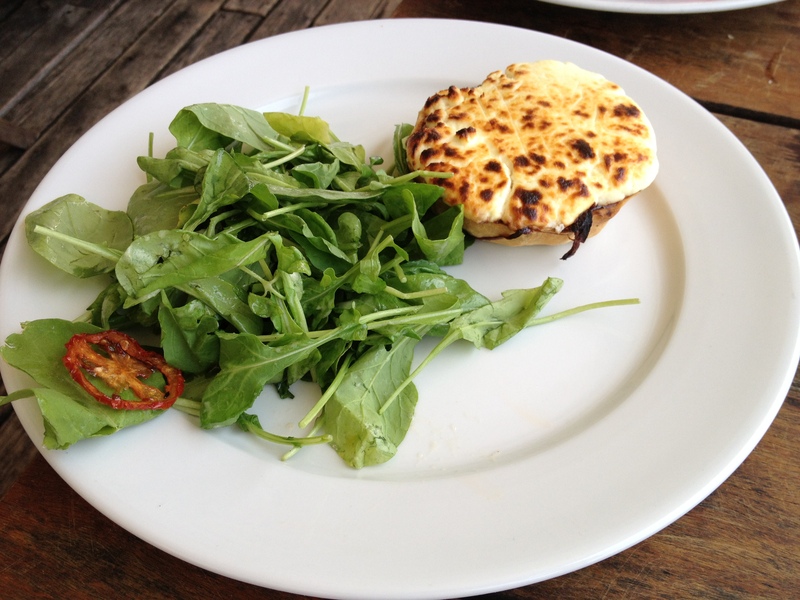 Bitter and limey roquette with crisp tomato balance the milky and fatty cheese with a fire burned coating served on a crunchy bread bun. The only disappointment was the squid appetizer with beetroot sauce, the sauce was the problem as it did not match the squids at all – too much creativity can kill a dish often and my previous experience at another restaurant in Uruguay confirmed that they generally need to figure out beetroot quite a bit. 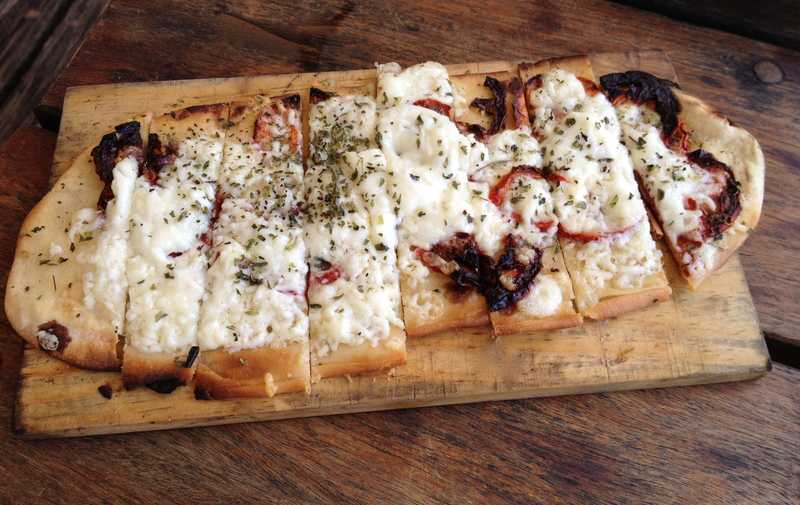 La Huella can do pizza very well! If you continue in a starter marathon then get the Goat cheese pizzetta on a thin crisp oval dough as it is not just a great companion to wine but also a perfect crispy snack to share. They get seasonal seafood so if they got the White clams that I have ordered try them as they are really fresh, juicy and palate pleasing. Perfect with a crisp Sauvignon Blanc! 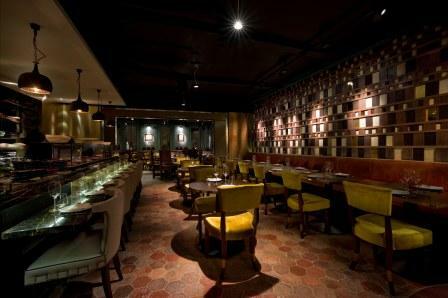 Seafood as well as meat dishes are the restaurant’s strengths. From the main courses I can recommend any steak as the meat is local, without hormones, just grass-fed, wild-nature raised and above all super tasty. The wood-fired grill throws a magic spell of yumminess on each meat that passes its heating throat. The grilled fish is also good, but to my taste the meat is better. After all living in Mediterranean can turn anyone in a fierce fish critic especially if you have the privilege of eating at my friend’s restaurant in Cap d’Antibes. Drinks: The bar area invites for a cocktail before or after your meal. 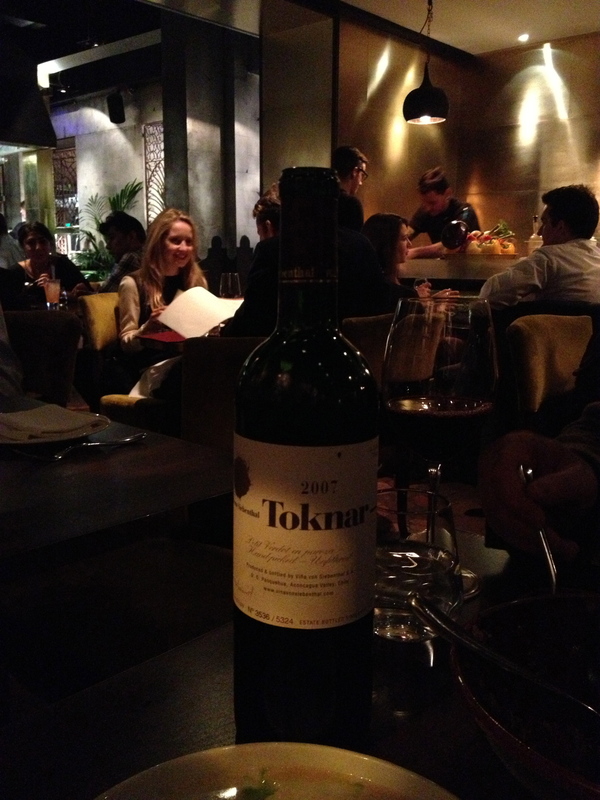 The selection of wines from South America is good and the wine waiter is willing to advise you. 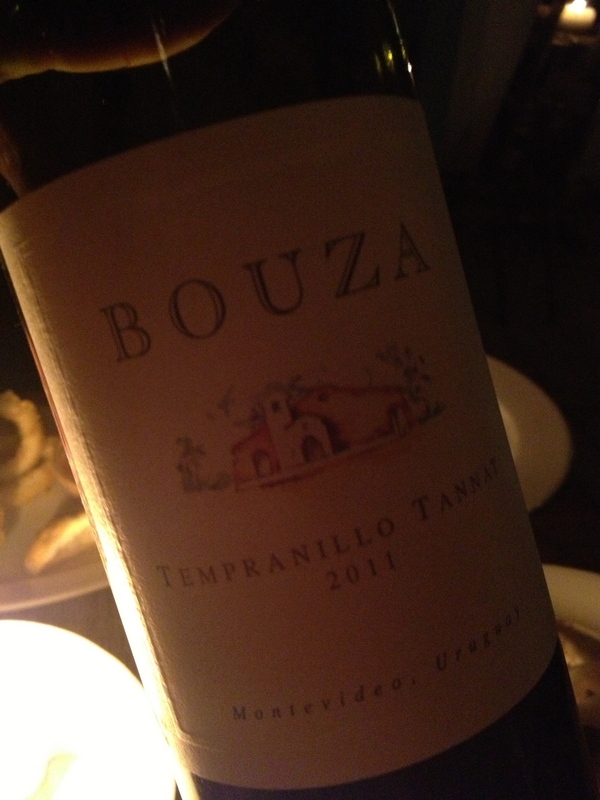 We went purely Uruguayan with a green and fresh tasting Sauvignon Blanc 1oo Años and later a red blend of Tempranillo with the local tannic Tannat from Bouza, one of the most famous producers in the country. The Sauvignon Blanc was perfect for a light lunch drinking, the red blend was perhaps too rich and heavy, but drinkable with the steak and it inspired me to order the Chocolate Volcano twice! Opening season: Out of season only for lunch, from mid-December till April also for dinner. Call and reserve a table ahead. 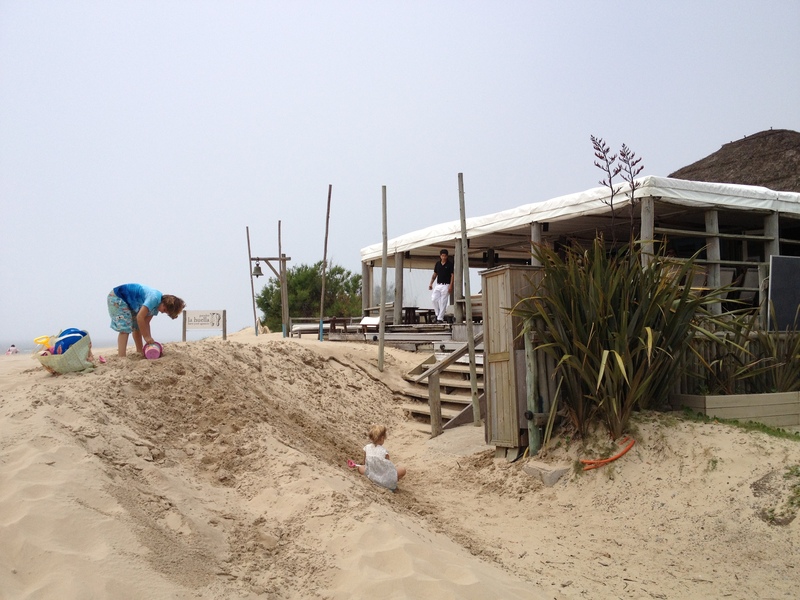 Address: Playa Brava, José Ignacio, Uruguay. Price: Medium to high (by many diners in 2012 it was “the best ceviche in Buenos Aires so it does not come cheep, yet not too crazy). Atmosphere: Young creatives, buzzing and quite low-key considering that it is located at a fancy neighborhood hotel Palermitano. The service is off-beat but effective. Wear anything you want, although anything youthful looking would fir in the most. 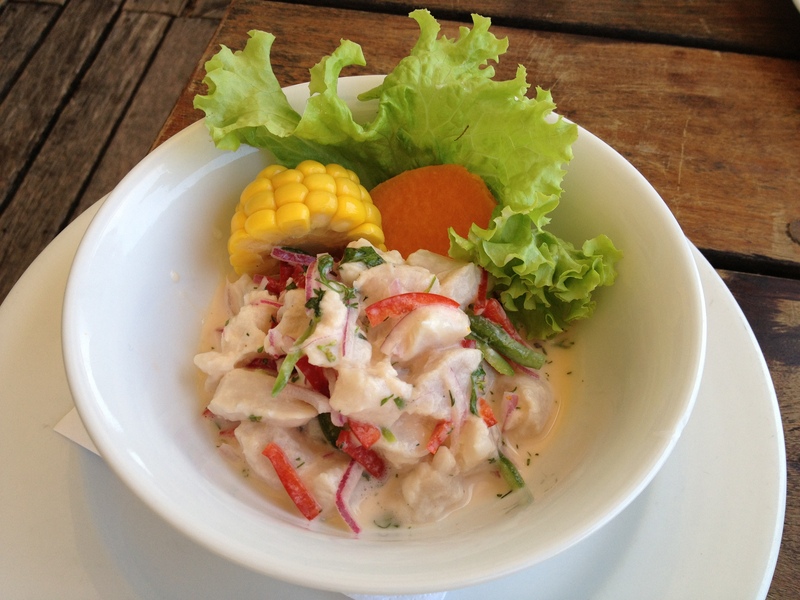 Food: Ceviche is a must here and was refreshing, juicy and intense as it should be. The white fish was fresh, corn kernels crisp, onion invigorating and the lime-based “Tigre di leche” sauce the server poured over it just after laying the plate on our table was not too sour, just right to add even more zest to the dish. From the starters we got the Spicy shrimp, that were to our taste a bit over-flavored. The shrimps were sautéed in sundried chilly, garlic and yellow pepper sauce, served on fancy spoons to slip easily into your mouth at one bite. Unless you had a mouth of a whale you ended up hardly chewing the contents of the spoon as there was almost no space to chew in your mouth. I found it easier to grab each shrimp with my chopsticks and dip it in the rich sauce if needed, but to my taste not much of it was necessary. 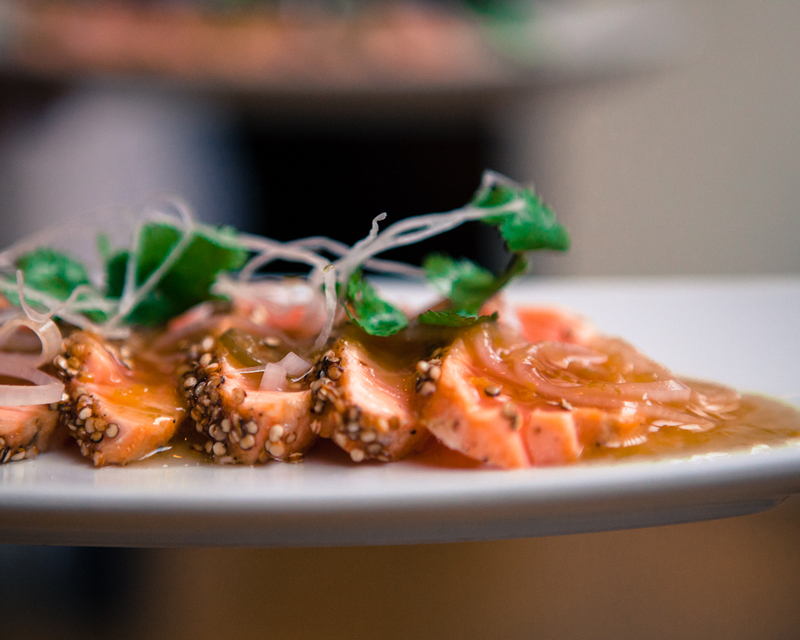 The Tiracuya Salmon tiradito (thinly sliced fish) had a perfectly delicate texture, yet it is better to share it with at least three people other wise you might end up a bit “over-salmoned”. It was served with passionfruit sauce bringing sweet and sour tone and with a crispy thin noodle-like topping, that was a bit tasteless yet fun to crunch on. The Sipan roll looked superb, yet the super-sweet home-made teriyaki sauce made it more of a dessert rather than savory roll with shrimp, salmon tartar, cream cheese and avocado. From the warm main courses we went for Seared seafood with vegetables that we saw our neighbors were having. We though that they could not finish it because of the portion being too big for them, yet, as we tasted in just a couple of moments later, it was too salty that eating it all might cause you a heart attack. The seafood was of a great quality and well cooked, just someone had to add an extra pinch of salt each time he stirred the veggies with the seafood. Overall, I would come back to this restaurant as it was better than the legendary South American chain of fancy peruvian eateries Osaka, but I would order just pisco sour and all kinds of ceviche from the menu. 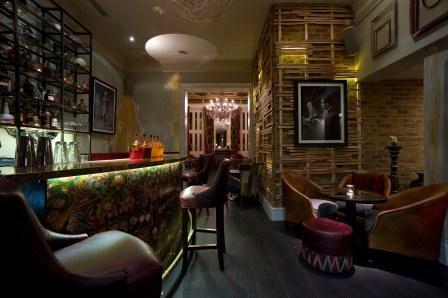 Drinks: I had one of the best – if not the best – Pisco sours in my life here. Go for it as an aperitif before your dinner or sip this refreshing cocktail based on a grape spirit pisco, egg-whites, lime and sugar during your meal. Pisco sour works wonderfully with the modern peruvian dishes. Wine is an option too. Alsatian Riesling, steely Pinot Gris or even the spice-bomb of a Gewurtztraminer are my favorite choices with this type of food. Although Argentina makes some of the later as well. We got a bottle of Gewurtztraminer from Rutini and liked it, except it was a bit more sweet than we craved for, so keep it in mind. Address: Hotel Palermitano, Uriarte 1648, Palermo, Buenos Aires, Argentina. Peruvian cuisine is a big hit worldwide this year. With the world’s top chefs, including Ferran Adria (El Bulli in Spain), flying over there in search for inspiration and new ingredients, the news spread across the globe quickly. Now you find peru-influenced restaurants almost anywhere outside Latin America from Los Angeles and New York to European capitals including London. I have been to Peru and dined on incredible local dishes so I am a harsh critic when it comes to tasting this food elsewhere in the world. They do a pretty good job in Santiago de Chile, yet as one gets further away such as to LA, the authenticity and quality tends to deteriorate. It is seductive for the chefs to devise over-complex dishes, yet the peruvian cuisine is elaborate enough, so any even the slightest retouch of the dishes can spoil everything. Using high quality and authentic ingredients also makes a difference. Peru has over 3.000 types of potatoes and you cannot just use any one kind to make a causa, the traditional potato dish. 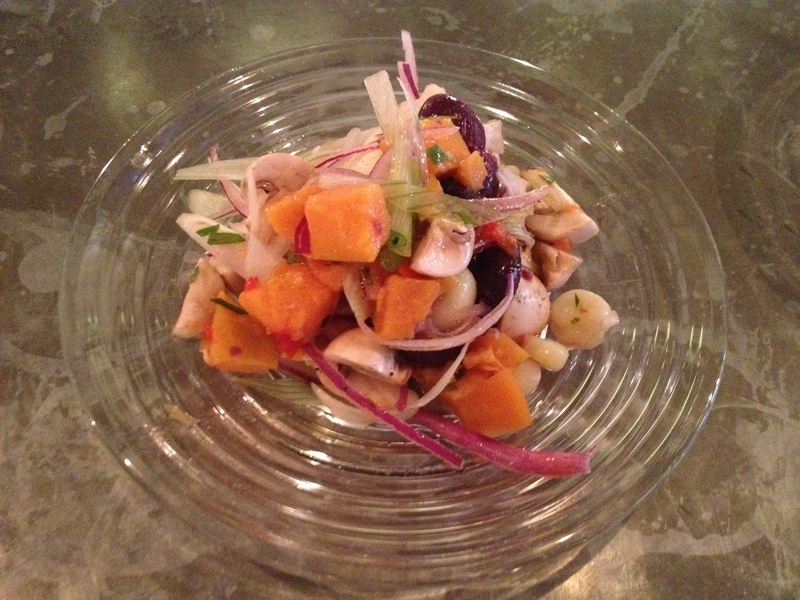 The London’s ceviche though is serious about its endeavor. No wonder, since most of its staff comes from Peru and they are proud of their heritage. Price: medium to low for central London; medium to high for elsewhere. Atmosphere: Vibrant, young and refreshing. 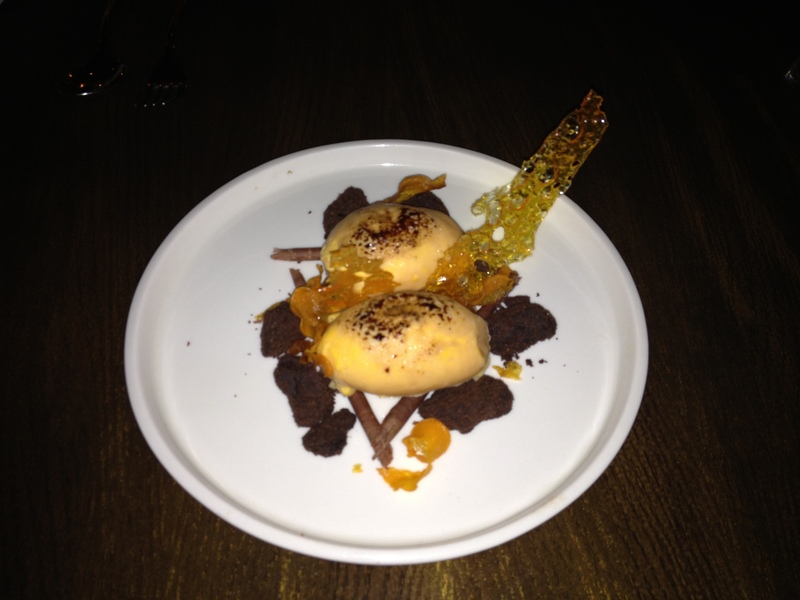 The staff is extremely friendly and helpful in explaining everything about your dish. 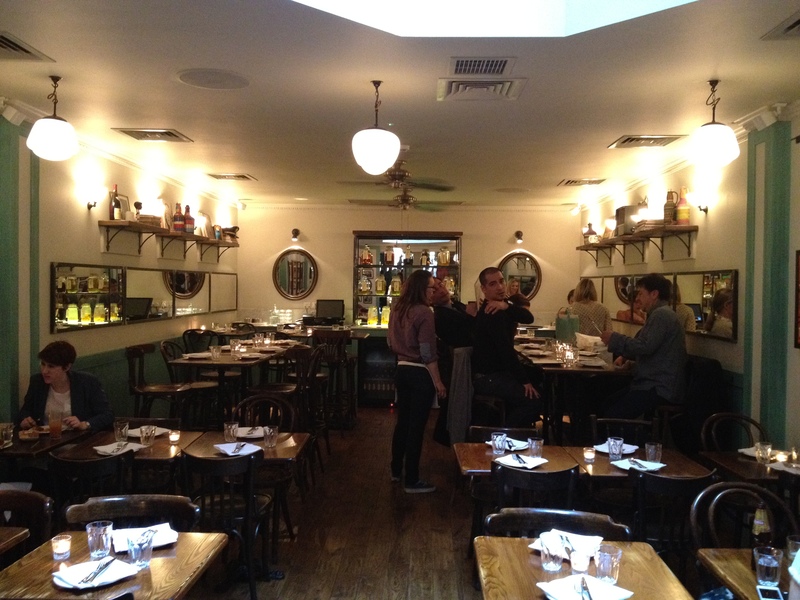 You can sit right at the bar on your right side as you enter Ceviche. From here you can watch the chef with his aides preparing colorful peruvian dishes in the speed of a 100 metres world champion runner. 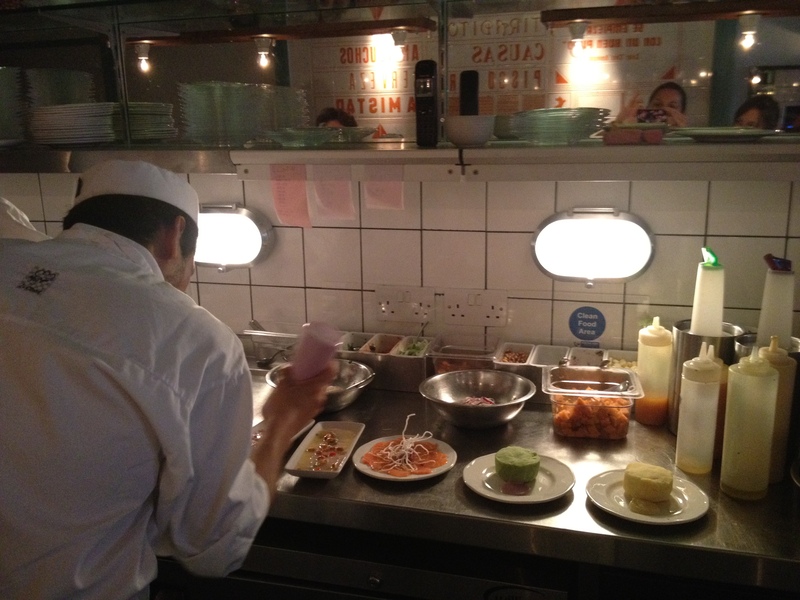 The demands are high as the place is currently extremely popular and the nature of tapas – smaller portions so people order more than two or three dishes – creates the buzzing atmosphere. If you prefer low chairs and sitting at your own table you walk further back and sit in a cosy room full of mirrors and after 7 pm of eager diners. Below I took the picture of the room around 6pm, so early for the dinner rush hour in London. Food: Authentic in a fashionable wrap. The dishes are arranged attractively on the plates, but do not be confused, they still taste as they would in Peru! Using quinoa, potatoes, corn, onion, seafood and meat is crucial in peruvian cooking. The only think I missed was the bony and delicate guinea pig, so popular in Cuzco where all the tourists acclimatize themselves before they take off to Machu Pichu. I did not miss the surgical work inseparable from eating this tiny animal. It is a delicacy though we will not probably savor in Europe any time soon. My favorite, and now a trendy superfood, was the Quinoa salad. I can eat it day and night, on its own or with poultry, fish, seafood or even meat for its refreshing properties. Delicate quinoa paired with crunchy onions, melting avocado and mango sauce is an exotic and unique dish. I recommend starting with it. 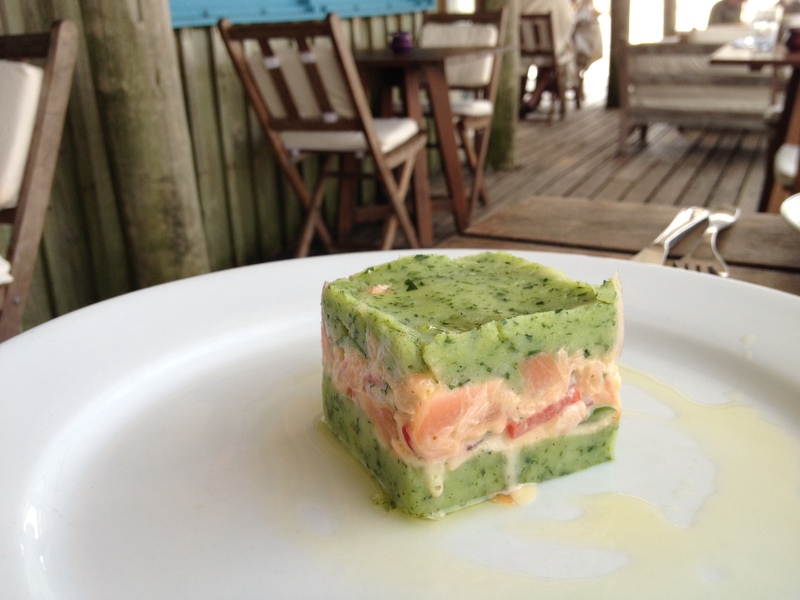 Or you can start with ceviche, Peru’s most famous food invention. Raw fish diced in cubes, tigre di leche sauce with lemon reduction taking off the fishyness from the meal, ever-present onions and sometimes corn, mushrooms and sweet potatoes such as at Ceviches’ “Ceviche del dia” version. Nice ceviche, but this one I get better in Peru, maybe because the fish is different. From here you can move to something heavier. A vegetarian option, and a very tasty one, is Potato Causa with beetroot. 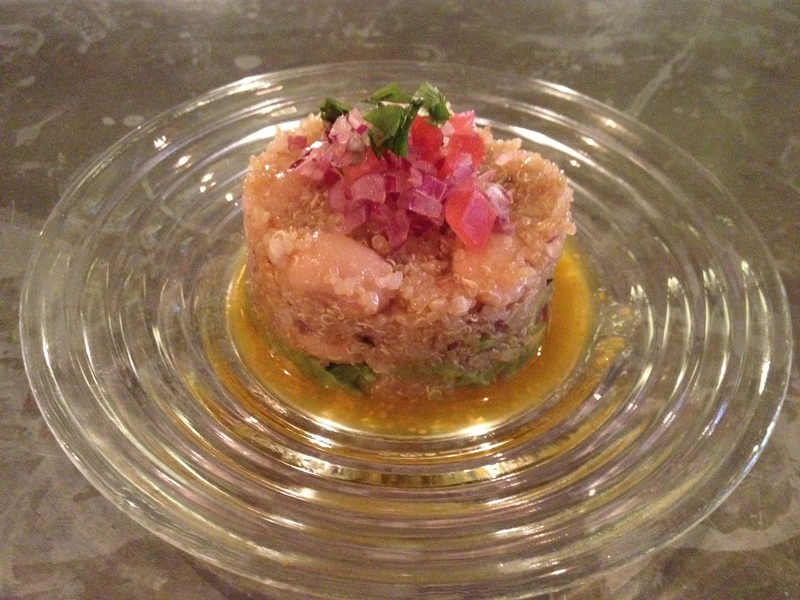 Causa is made of a bed of mashed sweet potatoes on which a wide variety of ingredients are piled up. 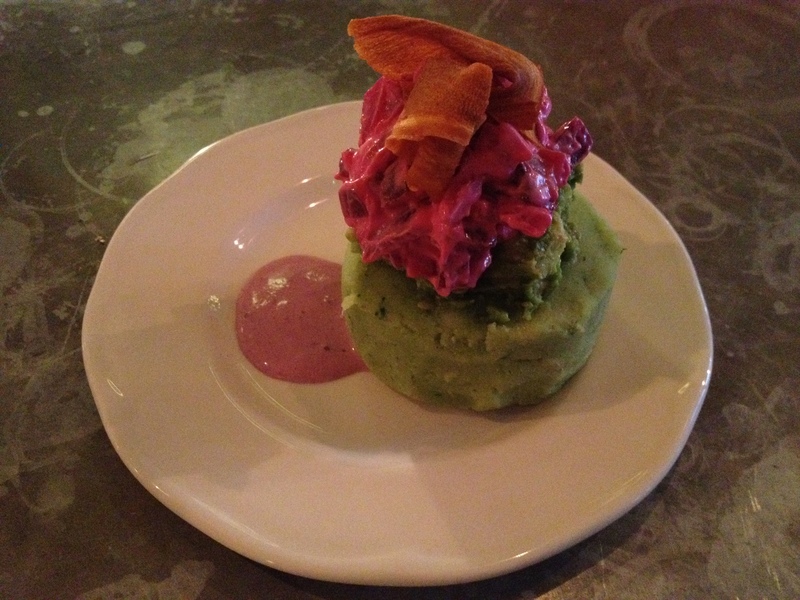 Avocado mash, creamy red beet chop topped with a crisp platano (big, not sweet banana used in American cooking) chip call for a glass of wine to help you digest this rich tower of ingredients. 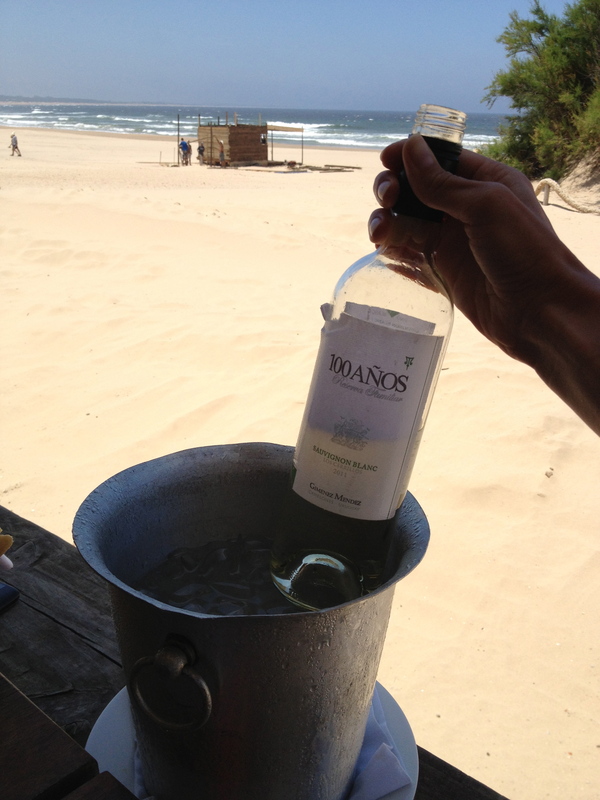 Something with higher acidity such as Sauvignon Blanc will do the job. 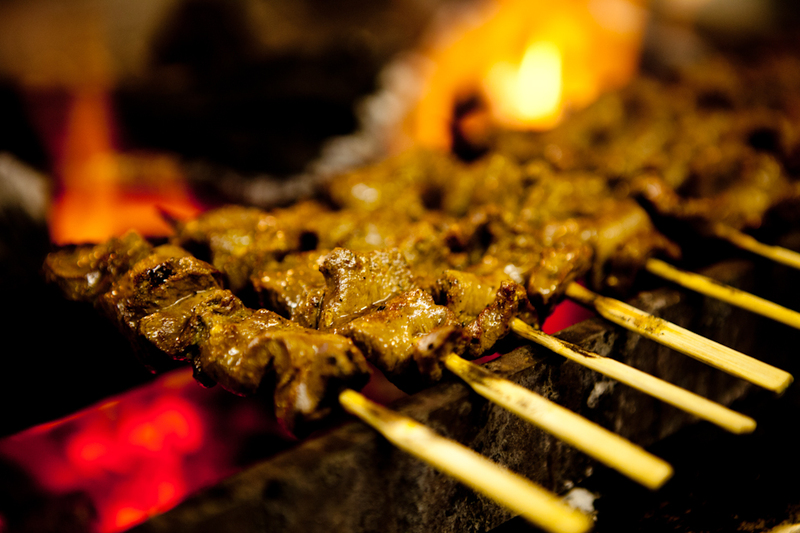 Meat aficionados will devour the antichuhos – marinated meat skewers. From chicken to beef hearts and livers, the peruvians jab through everything on the stick. It may sound horrific, but it tastes good. The antichuchos are served with a corn knob and usually a slightly spicy or creamy sauce. 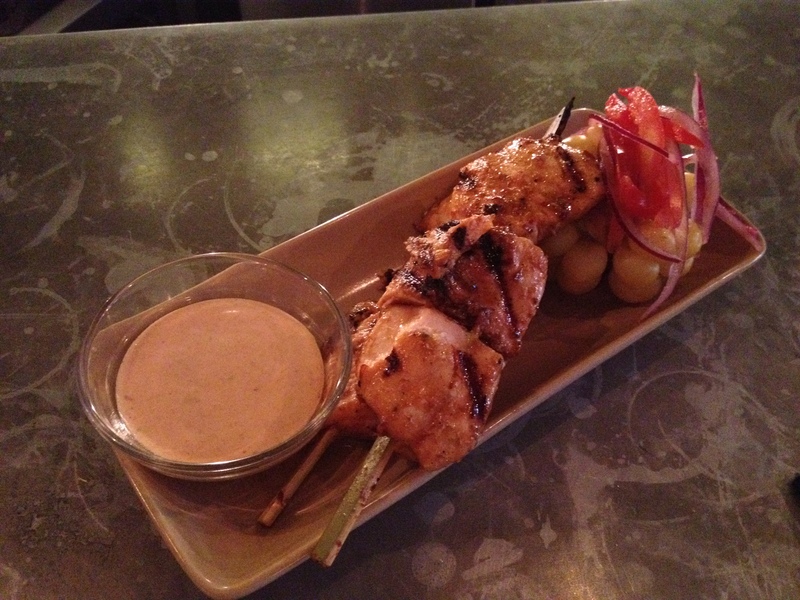 The chicken skewers at Ceviche were juicy and supple. 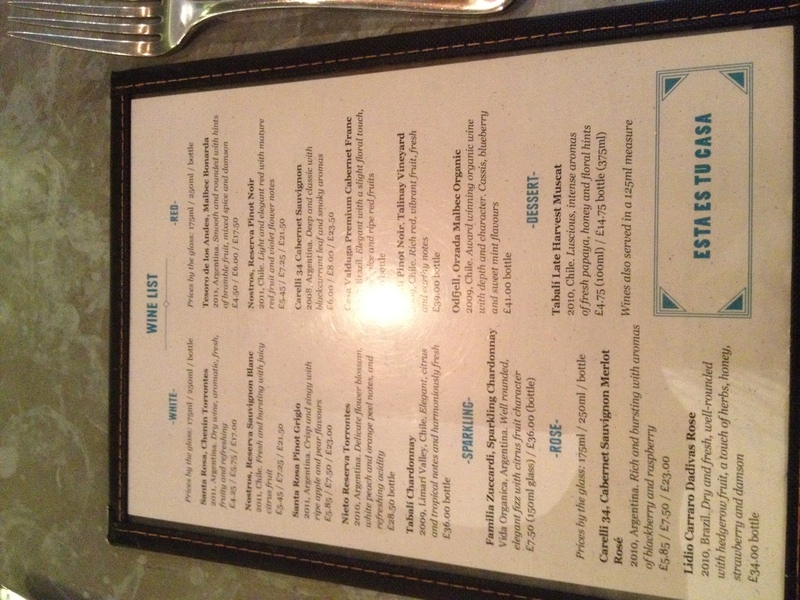 Drinks: The wine list is short but suitable for the dishes. From lighter wines to more concentrated reds and sweet wines. There are lots of Chilean wines but also some from Argentina. We are at a peruvian eatery though , so pisco, the grape spirit is a must! At Ceviche they make a wide variety of seductive cocktails based on pisco, but I am devotee of pisco sour – pisco with lime juice, sugar or sirup and egg white – so I had to get one. It was excellent! Even though I am a wine buff, next time I would drink pisco sour with peruvian food instead.